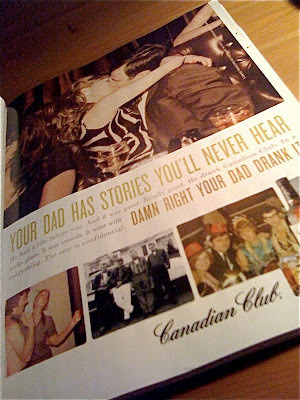 Canadian Club loves your dad. But can you measure love? But is it logical to judge advertising so quickly? Take whiskey. Canadian Club has been running a wonderful series of print ads that move beyond the product to the complex relationship that its consumer target, men in their 30s and 40s, have with their fathers. The gist is your dad had lots of whiskey-fueled adventures before you were born, so lad, pick up the booze your dad used. We don’t drink whiskey (well, unless we’re in Nashville), but this message has made us rethink it. We miss our dad. Canadian Club has created a clever emotional frisson. Now imagine measuring the success of this campaign. You could track responses (difficult), variances in media performance (more difficult), consumer awareness (is the brand now more recognizable? ), and of course product sales. You could even believe the wild claims of the agencies who create such stuff, as they build their typically inflated case studies to submit to an awards competition. But in a land of millions of product choices, chances are Canadian Club’s message will just lightly break through, as good as it is. And that’s OK. In many ways advertising is now a required cost of business, a messaging platform to keep up with competitors. The days of positioning, where you could grab a unique rung in consumers’ heads, are dying as product choices overwhelm our mental inventory. The question now isn’t whether consumers rush to respond; it’s what would happen instead if you went invisible and consumers failed to consider you at all. We’re not ordering whiskey tonight. We won’t jack up Canadian Club sales tomorrow. But next time we’re in Nashville, we may give dad’s drink a try. The answer to this question lies in what Alan said, “An ad either worked or it didn’t. A campaign was a resounding success or a dismal failure…” The ad industry has not come to grips with the subtitles of relationship marketing. Relationship marketing is facilitated by the advertising. In other words, it’s a lot harder without advertising. Advertising is just one, and generally the most superficial layer in the brand consumer relationship. Assessing the success of an ad isn’t a black and white exercise. Not all consumers want or need a relationship. For most, assuming they even see the ad, it will act as a gentle reminder. But heavy category users are more engaged, are more likely to see the ad and more likely to be open to a relationship. For them, they need more than advertising, they are looking for opportunities to engage in ways that are meaningful to them. Incorporating a digital strategy into the campaign helps achieve this. Maker’s Mark does a good job of this. The success of the ad should be measured based on its ability to influence heavy category users. The rest just makes the agency feel better. My dad would’ve probably read this in the morning after coming in late.